The Netherlands is a workers paradise. Just as in the Mafia where being a made man makes you untouchable, the same applies if you have an indefinite contract of employment. These are extremely valuable, but more difficult to attain than trying to get a Dutch woman to cook you a meal, or getting your rental deposit back from a Dutch property owner. It’s possible to achieve, but my God it takes some effort. One of the reasons why it’s so difficult to get an indefinite contract in the Netherlands is due to Dutch employment law being clearly structured to benefit the employee, rather than the employer. Once you have an indefinite contract, even if you beat the hell out of your manager, and serve time in prison for the crime, the employer will not only have to continue paying your salary during the period that you happen to be incarcerated, but also pay any accrued holiday pay, and guarantee that you can return to your position on release. Noooooooo, please your honor not that!! Ok I might be exaggerating ever so slightly, but you get the picture. It’s bloody difficult to fire people on permanent contracts. Dutch employers would sooner be forced to do business in German than offer people indefinite contracts. A knock on effect of all this jolly employee socialism has been the mass proliferation of people on temporary contracts. Under Dutch employment law it was possible to employ people on a temporary basis up to a maximum of three years or three temporary contracts. This loophole has been widely exploited by employers in the Netherlands. Which brings me to the subject of today’s post. Changes to Dutch employment law which take effect from July 1st 2015. 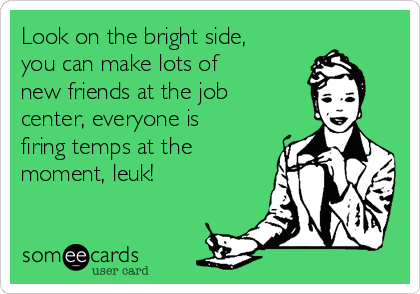 What a jolly nice bunch of chaps the majority of employers in the Netherlands are. Never in a million years would they employ people on temporary contracts, to the maximum period that the law allows, (three years) and then throw them out on the street, like last years Christmas tree. Which reminds me, why do so many Amsterdammers throw out their Christmas trees on the street in February? Do they love Christmas so much that they can’t bear to part with the tree? Or does throwing away something that they’ve paid for hurt too much, and they delay it as long as possible? Getting back to my point, temporary workers often end up like yesterday’s bitterballen. Cold, and a little greasy from the tears they shed from being handled so poorly. Imagine the trauma, you’ve spent three years, saying goodbye to Koen and Anouk every day as they rush out of the door at five fifteen to pick up their kids from the nursery. You’ve spent hours hanging out at the coffee machine, listening to all the gossip about how Tatiana wears too much makeup, and the American works such long hours because he hates his wife. You’ve bitched about how the IT helpdesk has been outsourced to India, and that they don’t speak English as well as the Dutch. “The helpdesk guy swore at me, can you believe it?” You then calmly explained that he didn’t swear, and what he actually said was “is the laptop in the docking position.” Not the F word. Then one fateful day, you’re called in to see the HR business partner. A grand title for a person who is paid to shake their head and say “according to the employee handbook.” When you receive the meeting request to see HR you’re surprised, as usually they are as elusive as pickpockets in Dam Square. You’re pleased as you’ve worked your firm buttocks off in the last three years, so hope that they want to offer you a permanent contract as a reward for all the hard work. We’re really grateful for how hard you’ve worked for us the last three years, but if we keep you on any longer we’ll have to give you an indefinite contract. Which means that if you become seriously ill we (and our insurance company) would have to pay you for up to 104 weeks, which is the highest sick leave period within the European Union. Obviously you’re not getting any younger, have you considered dying your hair? I can see grey hairs are coming already. You might also want to take up hockey which is a great way of losing weight. I’d invite you to join my team, but I know how much you earn, and you’re too poor to join our club. Anyway, you’ll be unemployed soon, which brings me to the subject of today’s meeting. We won’t be offering you an indefinite contract. The Dutch labour party (PVDA) and the trade unions are incredibly out of touch with the reality of working world. They have been behind the push to change Dutch employment law. Instead of three contracts or three years continuous employment. From July 1st, this will be reduced to a formula that is 3x2x6. This means a maximum of three contracts within a two year period, with a gap of no longer than 6 months from the start and end dates of the contract. 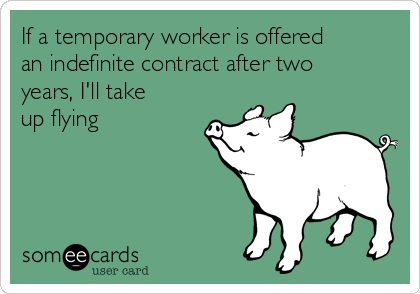 So after two years, temporary workers must be offered a permanent contract. If this doesn’t occur they are now entitled to an ontslagvergoeding. Which as an ex-girlfriend once said to me, “that’s a bit of a mouthful.”* An ontslagvergoeding is effectively a redundancy payment. As I’ve said, this takes effect from July 1st. The idea behind this was to motivate employers to make more temporary workers permanent. Meanwhile back on planet earth, the effect of this upcoming law, is that a number of Dutch corporations are already starting to make temporary workers redundant before the law comes into effect. Only one in twenty temporary workers are offered permanent contracts, so why in the name of Bob Marley the political classes believed that the new law would encourage employers to take on more staff is beyond me. If you’re currently on your third temporary contract, and it will end after July 1st, my advice to you is start looking for another job. There’s more of a chance of the winner of Holland’s next top model actually becoming well known, than the majority of temporary workers being offered permanent jobs. The PVDA are naive. I’d love to meet their leader Diederik Samsom and sell him shares in London Bridge. Other changes to the law are that for contracts less than two years, the maximum trial period (proeftijd) is one month. Trial periods are no longer allowed for contracts of six months or less. If you’re on your third contract, it’s worth discussing the situation with HR (if you can find them) or your agency.